With scale-out, client queries can be distributed among multiple query replicas in a query pool, reducing response times during high query workloads. You can also separate processing from the query pool, ensuring client queries are not adversely affected by processing operations. 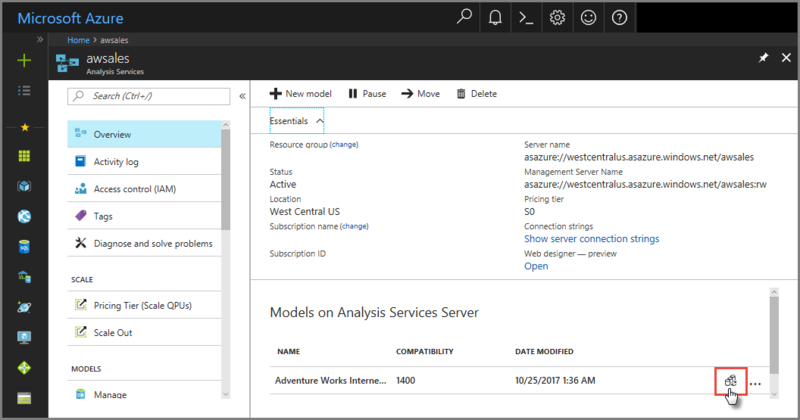 Scale-out can be configured in Azure portal or by using the Analysis Services REST API. Scale-out is available for servers in the Standard pricing tier. Each query replica is billed at the same rate as your server. All query replicas are created in the same region as your server. The number of query replicas you can configure are limited by the region your server is in. To learn more, see Availability by region. Scale-out does not increase the amount of available memory for your server. To increase memory, you need to upgrade your plan. With scale-out, you can create a query pool with up to seven additional query replica resources (eight total, including your primary server). You can scale the number of replicas in the query pool to meet QPU demands at critical times, and you can separate a processing server from the query pool at any time. Regardless of the number of query replicas you have in a query pool, processing workloads are not distributed among query replicas. The primary server serves as the processing server. Query replicas serve only queries against the model databases synchronized between the primary server and each replica in the query pool. When scaling out, it can take up to five minutes for new query replicas to be incrementally added to the query pool. When all new query replicas are up and running, new client connections are load balanced across resources in the query pool. Existing client connections are not changed from the resource they are currently connected to. When scaling in, any existing client connections to a query pool resource that is being removed from the query pool are terminated. Clients can reconnect to a remaining query pool resource. When configuring scale-out the first time, model databases on your primary server are automatically synchronized with new replicas in a new query pool. Automatic synchronization occurs only once. During automatic synchronization, the primary server's data files (encrypted at rest in blob storage) are copied to a second location, also encrypted at rest in blob storage. Replicas in the query pool are then hydrated with data from the second set of files. While an automatic synchronization is performed only when you scale-out a server for the first time, you can also perform a manual synchronization. Synchronizing assures data on replicas in the query pool match that of the primary server. When processing (refresh) models on the primary server, a synchronization must be performed after processing operations are completed. This synchronization copies updated data from the primary server's files in blob storage to the second set of files. Replicas in the query pool are then hydrated with updated data from the second set of files in blob storage. Perform a synchronization before the scale-out operation to avoid redundant hydration of the added replicas. When automating both processing and scale-out operations, it's important to first process data on the primary server, then perform a synchronization, and then perform the scale-out operation. This sequence assures minimal impact on QPU and memory resources. Synchronization is allowed even when there are no replicas in the query pool. If you are scaling out from zero to one or more replicas with new data from a processing operation on the primary server, perform the synchronization first with no replicas in the query pool, and then scale-out. Synchronizing before scaling out avoids redundant hydration of the newly added replicas. When deleting a model database from the primary server, it does not automatically get deleted from replicas in the query pool. You must perform a synchronization operation by using the Sync-AzAnalysisServicesInstance PowerShell command that removes the file/s for that database from the replica's shared blob storage location and then deletes the model database on the replicas in the query pool. When renaming a database on the primary server, there's an additional step necessary to ensure the database is properly synchronized to any replicas. After renaming, perform a synchronization by using the Sync-AzAnalysisServicesInstance command specifying the -Database parameter with the old database name. This synchronization removes the database and files with the old name from any replicas. Then perform another synchronization specifying the -Database parameter with the new database name. The second synchronization copies the newly named database to the second set of files and hydrates any replicas. These synchronizations cannot be performed by using the Synchronize model command in the portal. For maximum performance for both processing and query operations, you can choose to separate your processing server from the query pool. When separated, existing and new client connections are assigned to query replicas in the query pool only. If processing operations only take up a short amount of time, you can choose to separate your processing server from the query pool only for the amount of time it takes to perform processing and synchronization operations, and then include it back into the query pool. To determine if scale-out for your server is necessary, monitor your server in Azure portal by using Metrics. If your QPU regularly maxes out, it means the number of queries against your models is exceeding the QPU limit for your plan. The Query pool job queue length metric also increases when the number of queries in the query thread pool queue exceeds available QPU. Another good metric to watch is average QPU by ServerResourceType. This metric compares average QPU for the primary server with that of the query pool. In a Metrics line chart, click Add metric. In RESOURCE, select your server, then in METRIC NAMESPACE, select Analysis Services standard metrics, then in METRIC, select QPU, and then in AGGREGATION, select Avg. To learn more, see Monitor server metrics. 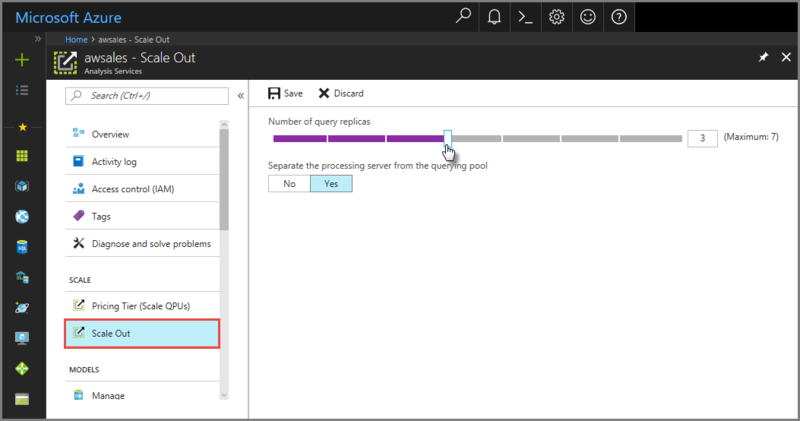 In Separate the processing server from the querying pool, select yes to exclude your processing server from query servers. Client connections using the default connection string (without :rw) are redirected to replicas in the query pool. When configuring scale-out for a server the first time, models on your primary server are automatically synchronized with replicas in the query pool. Automatic synchronization only occurs once, when you first configure scale-out to one or more replicas. Subsequent changes to the number of replicas on the same server will not trigger another automatic synchronization. Automatic synchronization will not occur again even if you set the server to zero replicas and then again scale-out to any number of replicas. Synchronization operations must be performed manually or by using the REST API. In Overview > model > Synchronize model. Before using PowerShell, install or update the latest Azure PowerShell module. To run sync, use Sync-AzAnalysisServicesInstance. To set the number of query replicas, use Set-AzAnalysisServicesServer. Specify the optional -ReadonlyReplicaCount parameter. To separate the processing server from the query pool, use Set-AzAnalysisServicesServer. Specify the optional -DefaultConnectionMode parameter to use Readonly. On your server's Overview page, there are two server names. If you haven't yet configured scale-out for a server, both server names work the same. Once you configure scale-out for a server, you need to specify the appropriate server name depending on the connection type. For end-user client connections like Power BI Desktop, Excel, and custom apps, use Server name. For SSMS, SSDT, and connection strings in PowerShell, Azure Function apps, and AMO, use Management server name. The management server name includes a special :rw (read-write) qualifier. All processing operations occur on the (primary) management server. Issue: Users get error Cannot find server '<Name of the server>' instance in connection mode 'ReadOnly'. Solution: When selecting the Separate the processing server from the querying pool option, client connections using the default connection string (without :rw) are redirected to query pool replicas. If replicas in the query pool are not yet online because synchronization has not yet been completed, redirected client connections can fail. To prevent failed connections, there must be at least two servers in the query pool when performing a synchronization. Each server is synchronized individually while others remain online. If you choose to not have the processing server in the query pool during processing, you can choose to remove it from the pool for processing, and then add it back into the pool after processing is complete, but prior to synchronization. Use Memory and QPU metrics to monitor synchronization status.